Books: 1) Cambridge History of China Vol. 6 (Cambridge University Press); 2) 2) “Housing, Clothing, Cooking, from Daily Life in China on the Eve of the Mongol Invasion 1250-1276" by Jacques Gernet (Stanford: Stanford University Press, 1962). 3) Schafer, Edward H. “The Golden Peaches of Samarkan,” Berkeley: University of California Press, 1963; 4) The Culture and Civilization of China, a massive, multi-volume series, (Yale University Press); 5) Benn, Charles, “Daily Life in Traditional China: The Tang Dynasty,” Westport: Greenwood Press, 2002;You can help this site a little by ordering your Amazon books through this link: Amazon.com. Los Angeles County Museum of Art description of Lacquer Tray with Phoenixes, Southern Song dynasty (1127–1279), Red, yellow, and black lacquer on wood: In China, objects made from lacquer—a seemingly humble material produced from tree sap—were, in fact, highly prized luxury goods. Carved lacquers such as this finely detailed tray, for example, could require the application of hundreds of layers of lacquer, and take over a year to complete. The tray's motif of paired phoenixes, arranged in a circular configuration, became a common theme under the Chinese Yuan dynasty (1271–1368) and in Ilkhanid Iran in a variety of media, including ceramics. The opposed phoenixes in flight are set among flowers representing each of the four seasons: 1) winter, plum blossoms; 2) spring, peonies; 3) summer, lotuses; 4) autumn, chrysanthemums. This piece belongs to the Arthur M. Sackler Gallery, Smithsonian Institution, Washington D.C. In the Yuan Dynasty floral motifs and cobalt blue paintings were made under a porcelain glaze. This was considered the last great advancement of Chinese ceramics. The cobalt used to make designs on white porcelain was introduced by Muslim traders in the 15th century. The blue-and-white and polychrome wares from the Yuan Dynasty were not as delicate as the porcelain produced in the Song dynasty. The world record price paid for an art work from Asia is $27.8 million paid in March 2005 for a 14th century Chinese porcelain vessel with blue designs painted on a white background. The vessel contains scenes of historical events in the 6th century B.C. and has a unique Persian-influenced shape. Only seven jars of this shape exist in the world. The buyer was Giuseppe Eskenazi., the renowned dealer of Chinese art, acting on behalf of a client. 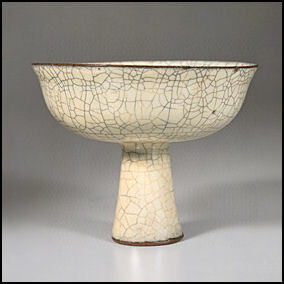 The previous record for porcelain was $5.83 million paid in September 2003 for a14th-century blue-and-white porcelain vessel called the pilgrims vessel. Text Sources: Robert Eno, Indiana University indiana.edu /+/ ; Asia for Educators, Columbia University afe.easia.columbia.edu <|>; University of Washington’s Visual Sourcebook of Chinese Civilization, depts.washington.edu/chinaciv /=\; National Palace Museum, Taipei npm.gov.tw \=/ Library of Congress; New York Times; Washington Post; Los Angeles Times; China National Tourist Office (CNTO); Xinhua; China.org; China Daily; Japan News; Times of London; National Geographic; The New Yorker; Time; Newsweek; Reuters; Associated Press; Lonely Planet Guides; Compton’s Encyclopedia; Smithsonian magazine; The Guardian; Yomiuri Shimbun; AFP; Wikipedia; BBC. Many sources are cited at the end of the facts for which they are used.